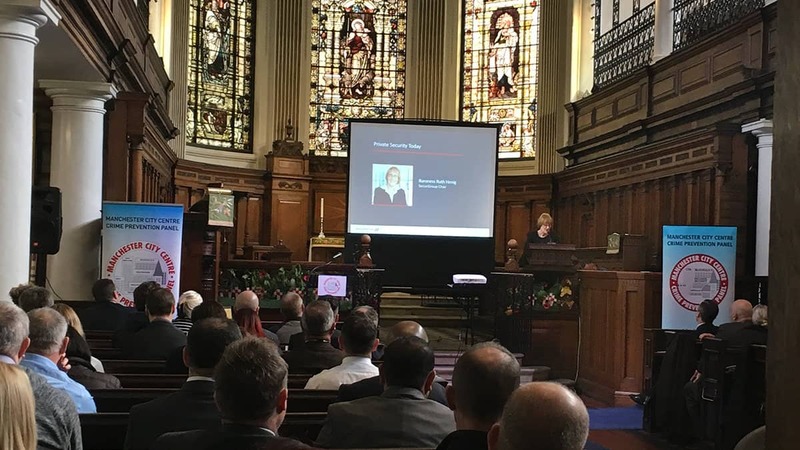 Baroness Ruth Henig, SecuriGroup Chair, was invited by the Manchester City Centre Crime Prevention Panel to deliver a presentation at an event supported by the Greater Manchester Police and Manchester City Council. The event provided valuable advice and guidance to help businesses protect their people and property against crime. Presentations covered issues relating to terrorism, local policing, anti-social behaviour and personal robbery. There was also a briefing on the introduction of Project Servator to Manchester – the effective police initiative which has been shown to deter, detect and disrupt a wide range of criminal activity. SecuriGroup Chair, Baroness Henig, provided an input on "The Value of Security", discussing a range of topics: investing in high-quality security providers; well-briefed private security staff; the importance of training; the challenges in providing 'front-line' assistance to the public. Assistant Chief Constable of Greater Manchester Police, Russ Jackson QPM, opened the event with a discussion on "The Counter Terrorism Landscape" - with a natural focus on the Manchester bombing. Baroness Henig referenced this, and the Borough Market bombings, to illustrate how both events highlighted the importance of private security professionals. Often on the front-line, private security professionals are often one of the first responders in the immediate aftermath of these kinds of events, doing everything they can to provide assistance. One of Ruth's points was that the public deserve well-trained, competent guards. Promoting the industry, Ruth also addressed her awareness of the low opinion police services can hold as a result of experience with poor quality private security suppliers. As part of her presentation, Baroness Henig stated that the standard of the best private security providers can be as good as the police – and pointed to the raised standards on show where police services engage in partnership working with security providers. Excellent inputs on the challenges faced in Manchester were also delivered by Baroness Beverly Hughes, Chief Inspector Cherie Buttle of Greater Manchester Police, and Inspectors Jon Middleton and Jon Adams of Greater Manchester Police. The latter covered the introduction of Project Servator to Manchester, an effective police initiative designed to deter and disrupt hostile reconnaissance and criminal activity.